Here are – genuinely – the six most commonly asked questions in 2016 from those interested in commissioning our work. They’re not in any order. Maybe what you want to know is here. Can your company tell us our most important bloggers? This is a bizarre one. This was our most frequently asked question in about 2008-09. Then it completely fell from view until about eighteen months ago. There’s no demand-side reason why it’s come back. Bloggers are no more important or central to the influencer ecosystem than they were in those intervening years. It’s come back purely because in the past eighteen months these blogger / tweeter influencer database providers have emerged who tout the importance of bloggers & tweeters. In doing so they’re trying to persuade the marketplace that these people are now the main influencers. They not – they’re just the easiest to identify and follow at mass-scale. We can tell who are our clients most important bloggers – though it makes far more sense to identify them in context with your other influencers. Can you tell us your pricing? Whenever this is the first question we know they’re not going to be our kind of client. They’re just comparing us with the monthly subscription blogger database providers. Once we hear the brief we can give ballpark pricing – though we’re not about to give it here! What we charge is nothing compared to the cost-savings and new routes-to-market we offer. Have you worked in the (named) industry sector before? We understand that many prospective clients want to know we have experience in their particular market sector. But it’s less critical than you might initially think. Our influencer methodology has been proven to be applicable across B2B, B2C, political and educational sectors – and we’re always keen to prove it in new arenas & geographies. Having said that, we now have experience in a great number of commercial sectors and across forty countries in four continents. How quickly can you tell us who our most important influencers on social media are? Regardless of whether our clients are looking for their top influencers on social media or across multiple channels (we cover offline, online & social), our commissions take a minimum of five weeks. While everyone might like their results instantly, since they’ve never known who their top market influencers have been before, year after year, we can’t help thinking a five week wait should be largely irrelevant in the scheme of things. If we wanted to engage with them, would we have to pay most of the influencers that you identify? Many come to us with the mindset that most influencers are, by their nature, pay-for-play. This isn’t the case at all. It’s often only the low-end bloggers & tweeters who are pay-for-play. And they’re unlikely to be significant influencers anyway. The real market influencers influence in many different ways, and come from very different walks of life. Your value to them is not through illicit paid-for endorsements. Were that the case they’d lose all credibility. Your ‘payment’ to them is the market insight and industry contacts you can bring. 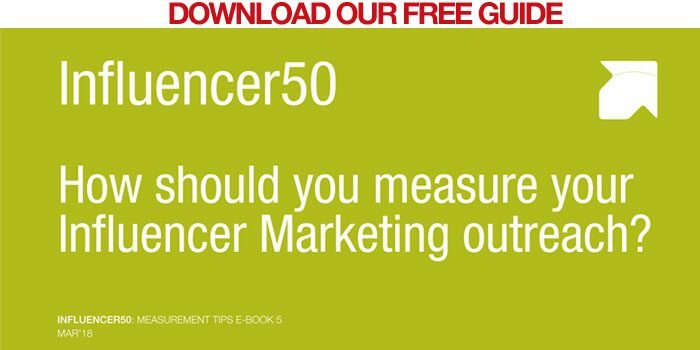 How do your other clients measure the value of working with their influencers?